If you love cheesy and creamy tasting Alfredo sauce but are looking for a version that’s lighter in calories, or if you need or want to eat vegan or dairy-free- I have your perfect recipe right here. Creamy Cashew Alfredo Sauce is perfectly creamy as the name implies but how weird that it tastes cheesy too (?). Really, you could serve it to guests with no explanation and they will love it. Made with a little bit of lemon juice and garlic cloves, I think these two ingredients create the perfect brightness needed an the full flavor wanted. By the way, you can also pump up or change the flavor with some groovy add-ins, but let’s start with basic sauce for a minute. One great thing about this sauce is that it’s ‘Alfredo in five minutes’ if you have a high powered blender. If your blender is kind of weak or you want to make the Alfredo using your food processor, it can still be done with perfect success if soak the cashews for about 20 minutes or up to an hour, if you have the time. Still ready pretty quickly even if you need to soften the cashews. Along with the cashews, lemon juice and garlic I mentioned, I added some dried thyme, salt and of course, water. That’s all you need for an excellent Alfredo! This is what the sauce looks like without soaking. Nice and thick so it clings well to your pasta. As you can see it’s not PERFECTLY smooth in my photo but this just gives the Alfredo a nice texture reminiscent of sauce with Parmesan grated into it. If you want your sauce silky-smooth then by all means soak the nuts for a bit and you will achieve that ultra-smooth texture. Of course, you can’t talk about a healthy pasta sauce without showing it over zoodles; and though tasty with the zucchini, we preferred our Alfredo over the pasta. But I think that’s because I’m still trying to get down the whole “fresh-tasting zoodles without turning soggy” process. This Alfredo will cling perfectly to vegetables or pasta. After the basic ingredients for the Alfredo are added you can get very creative. If you want the sauce to be more of a garlic Alfredo, add even more garlic cloves (I know, obvious). 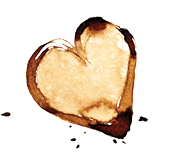 If you have nutritional yeast on hand, then you know that adds a nice cheesy flavor to anything so add at least a teaspoon of that to the sauce, adding more to taste. Some unique options to think about- fresh herbs of your choice or a little pesto, Sriracha for a totally different sauce with kick, or if dairy-free is not a concern, add in some shredded Parmesan. You can keep it simple or get kind of crazy, depending on what you want to do with the sauce. And don’t just think of this as an Alfredo sauce over pasta. It also makes an excellent vegetable dip. Give it a try and let me know what you think! I’d love to hear some other creative ways you come up with for serving creamy cashew Alfredo sauce. 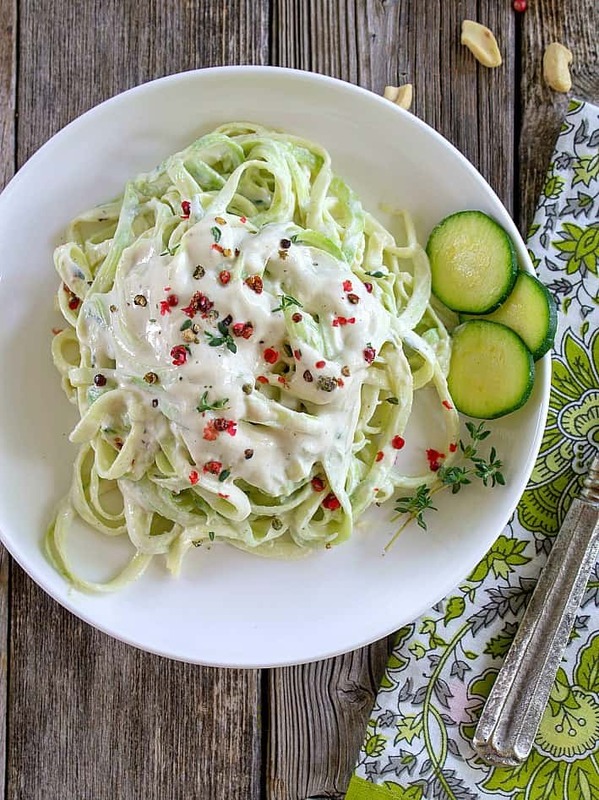 This is a great dairy-free alternative to traditional Alfredo sauce. Lower in calories, this is absolutely creamy! Leftovers keep for several days in the refrigerator and make an excellent vegetable dip option, too. Place all the ingredients into your blender (See #2 recipe note for ideas for other cool add-ins). Blend until smooth. Taste and add more salt, thyme, or garlic as desired. If you want your sauce a little thinner, add more water, 1 teaspoon at a time. In a large bowl, combine most of the sauce with approximately 16 oz. of your favorite cooked noodles, or 3-4 medium zucchini, spiralized into "zoodles". Toss using two forks or tongs until the sauce is distributed over the pasta or vegetables. Add more sauce as needed. Season with cracked black pepper or pink peppercorns for color (be careful not to add too much of the pink peppercorns, they can be overpowering). Drizzle with a little extra-virgin olive oil, if desired. Store any leftover or reserved sauce in an air-tight container in the refrigerator for up to 3 days. If your blender is not super efficient or if you want to make the sauce in a food processor rather than a blender, soak the cashews in warm water for about 20 minutes and up to an hour. This will soften them, making the cashews easier to cream into a smooth sauce. Drain the cashews before blending. If you have a reasonably powerful blender however, this step isn't necessary. 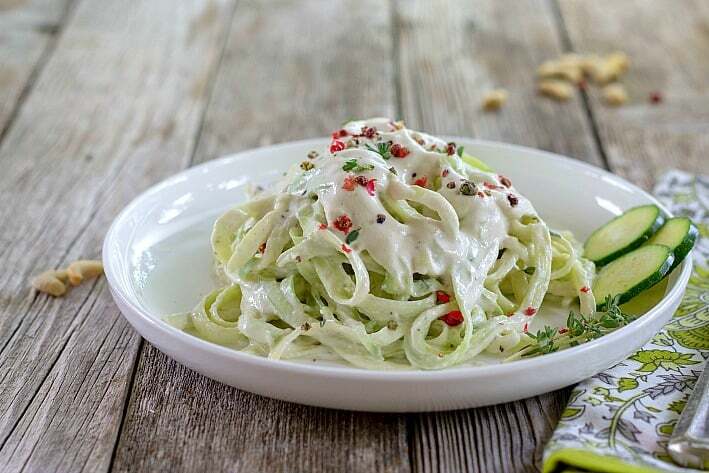 Some other things that would be tasty and super cool to add into this alfredo sauce are: Pesto, basil, or any fresh herbs; red pepper flakes; extra garlic cloves, like 5-6; Sriracha for some kick; and if you're not needing a dairy-free alfredo, shredded Parmesan cheese. The nutritional yeast is optional but adds even more cheesy flavor to the sauce. I wouldn't bother if you don't have some on hand. This recipe is easily doubled if you need more or want extra for another use on another day. Recipe adapted from Cook Lively cookbook. Btw, I notice that you didn’t put any cheese in Ingredients part . Love that this is made with cashews!! I am definitely putting this on my to-do list! You made alfredo sauce more creamy. I love the version of cashew in it. We use cashew to make curries gives thickness and taste yum. Cashew cream is one of my absolute favorite flavors. I use it almost everywhere that calls for cream. I haven’t tried it as an alfredo sauce though, I’ll have to give this one a try. It looks delicious. I LOVEEEE this. Homemade sauces are so much better than any store bought stuff. This cashew version I haven’t tried yet but I’m saving this to try with my pasta dinner this week. Sounds so easy and so tasteful. I love this healthier alfredo alternative because to be honest, creamy pasta dishes are my weakness. I have to try this soon and I definitely need to make a note to pick up nutritional yeast. It seems to be a very popular ingredient these days and a staple for vegan cheese sauces. Thank you! This looks amazing! 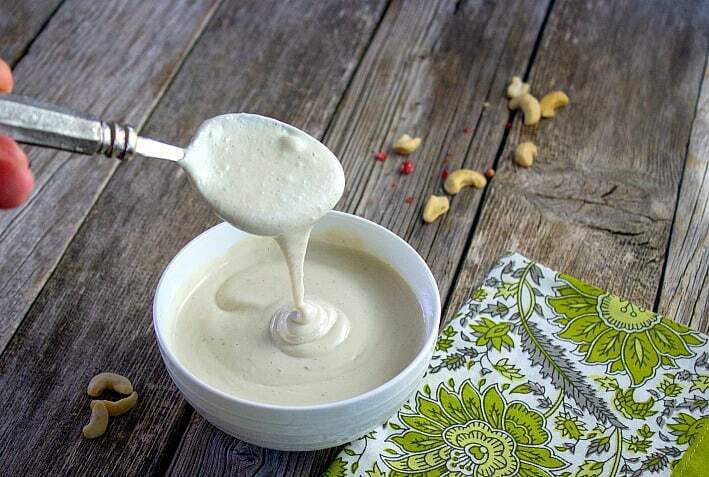 I love a good creamy sauce for my pasta and love that this is made from cashews! Such a great healthier alternative. Thanks Carmy! It really does taste creamy, and cheesy! Pasta is a staple in my home and I love this healthier version of alfredo sauce. BTW, your photos are beautiful. What can I say, I’m Italian and I love pasta!! We enjoy all kinds of sauces over our pasta but this one is very intriguing. It not only dispenses with the heavy cream but you can make it in no time at all. I’ve got to make this soon. We generally eat pasta with tomato sauce … so alfredo is a treat. This recipe seems so much healthier than traditional recipes. 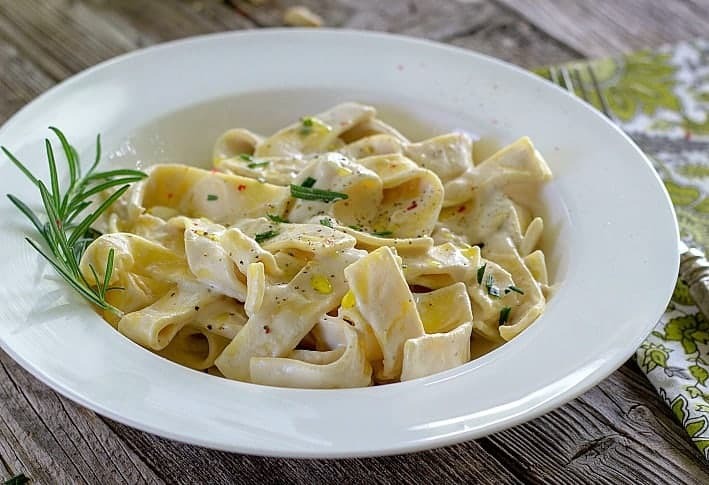 Hi Noel, We serve tomato based sauces much of the time but this cashew Alfredo has been a nice change especially for my son who cannot have lactose, but loves cream sauces. Thanks for stopping by! I love pasta and I usually adore the original Alfredo sauce but this cashew version does sound so good. Cashews are definitely a favorite in our house so this is perfect for us. Hi Veena, I think you would really like this alternative. Thanks for stopping by! Nice!! You really have given it that creamy vibe! I think a touch of nutritional yeast is a great idea. This would be a fantastic way to have a healthy version of alfredo! Thanks Nicolas! This healthy option was a pleasant surprise for us the first time I made it. The pasta lover in me loves the sound of this recipe. That sauce sounds amazing. What a nicel alternative to a tomato sauce. Thanks Gloria, this really tastes cheesy and creamy so it satisfies that alfredo craving. I just recently tried my first cashew based sauce and I totally loved it. 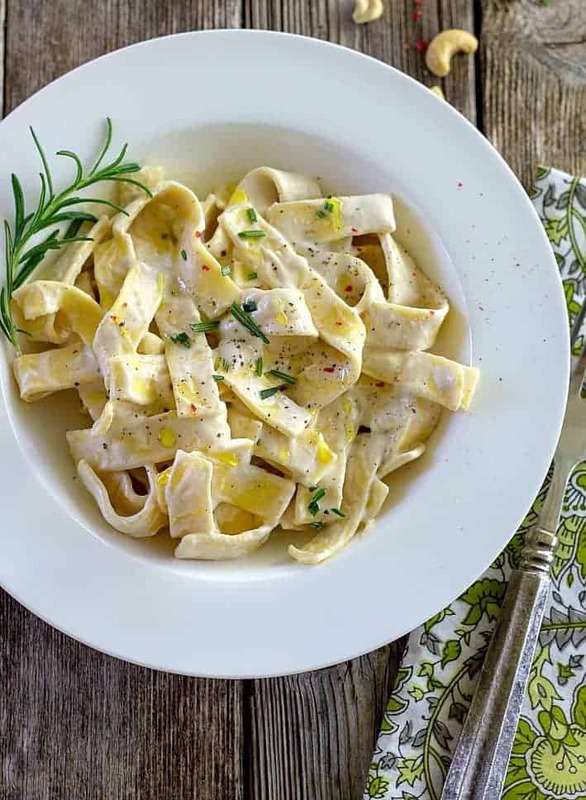 This take on Alfredo sauce sounds absolutely divine! Thanks Nicole, we were definitely surprised and delighted with it. A good alfredo is so satisfying, it’s one of my favorite sauces ever. Hubby loves cashews, I bet he’d like this sauce.